On December st, 1966, The French radio France Culture, broadcasts the homage to Lewis Carroll by Jaques Lacan. Later this homage would be established as a text in the Freudian Field publication: Ornicar?  Jacques Lacan: â€œMy Teachingâ€� and â€œI Speak to the Wallsâ€�. Conversation in Rimini with the participation of Antonio Di Ciaccia.